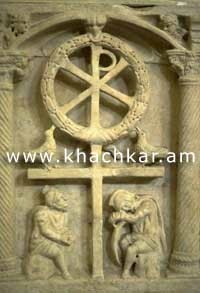 The ideology and iconography of the cross in early Christian Armenia. First crosses and cross compositions. The creation of the main patterns of composition and architecture of the khachkar. To understand the origins of the composition of the khachkar it is necessary to pay special attention to ideological-religious and cultural processes that were taking place in the 4th-7th centuries in Armenia. As a result of these processes, together with a number of complexes of national identity like Armenian alphabet, book, etc., the principles of the organization of sacred space, the national worship of the cross, and the iconography were shaped. The development of these complexes and the specific historic-cultural environment led to the emergence of khachkars. According to the evidence presented in the "History" by Agatangeghos, which is a presentation of the proclamation of Christianity as a state religion in Armenia in the beginning of the 4th century, in process of spreading of Christianity an important role had played the temple and an open-air stele. The Vision of Grigor the Enlightener, which is a part of mentioned "History", states, that the first cross-bearing steles and temple appeared in the center of the capital of Armenia as a result of a miracle. If the temple was the symbol of the surrounding holy territory, to a certain extent it was in opposition to secular, non-holy territory. Thus the cross-bearing stele aimed to give holiness to the open air, to secular territory, easing the conflict between the holy and non-holy, and eventually between the believer and the non-believer. It was thought in medieval Armenia that the Armenian letters were depicted to Mesrop Mashtots (father of the Armenian alphabet) by a miracle. Thus, the stele, the temple, and the letters, were given to Armenians through a miracle and represent the three main, equal directions and means in the process of spreading and strengthening of the new belief. The first stele in the vision of Grigor the Enlightener comes as a result of the victory over pagan forces, the remaining three as the result of the martyring of the virgins. Hence, in this vision, which has a keynote nature for Armenian Christianity and the Armenian church, demonstrates the victorious (first stele) and savior (the steles of the virgins) symbolization of the cross, which fully corresponds to the symbolism of the cross created in the 4th century. 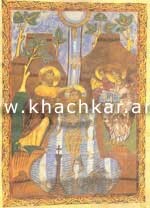 There are no details on the form or appearance of the cross in early Armenian written sources. Its form and general appearance and its symbolic meaning, are issues, which can be addressed by a comparative analysis of the general symbolism of the cross in the first centuries of Christianity, by a restoration of the graphics and corresponding materials. In the New Testament we see the first attempts to interpret the crucifixion as salvation and victory, which constitutes the general wisdom of Christology. But these are indefinite references, which do not rule out the clear practice of the holy cross and do not describe its outer appearance. In the antique world the death penalty through crucifixion was considered to be the most humiliating form of capital punishment. This perception of the cross as a tool for a shameful death was shared by the early Christians as well, and it took some time for this to be overcome. We should consider as accepted the opinion that until Constantine The Great the cross had been considered a tool for murder and disrespect, and was used rarely as a symbol of Christianity and as complementary for the other symbols. It is characteristic that in 4th-5th centuries, among the most important instructions by the first creators of the cross philosophy was that there was no need anymore to be ashamed of accepting and worshiping the cross. Due to wide-ranging preaching, the cross quickly was transformed into an exclusive sign of Christian identity, by which started, proceeded and finished every thought, ritual and beginning. In the popularization of cross worship and the emergence of the khachkar, an important role was also played by the particular kind of cross worshiping of the Armenian Church. 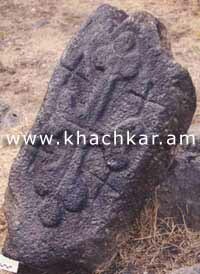 Another basis for the emergence of the khachkar and for the development of popular reverence toward it was the worshiping of a free standing outdoor rock, a mountain and eventually simply a stone. 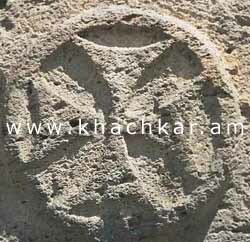 The oldest documented crosses in Christian Armenia were the monogrammatic crosses. These are crosses encircled in a wreath, surrounded by doves that represented the souls of the believers, and situated in a garden-paradise environment. 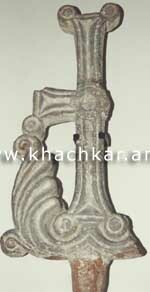 But in early medieval Armenian art, encircled crosses with radial enlarged wings are more characteristic. These became widespread both as a type of free-standing cross-bearing stele, and as an architectural detail on different sacred structures. Starting already from the earliest examples, the solar-illuminated design was paralleled with an essentially vegetative one, which became one of the bases for the further development and eventual emergence of the cross composition. The cross with pulled proportions (the two elements of the cross � the horizontal and vertical pillars, do not intersect in the middle, but rather the horizontal element transects the vertical element at a point above the center), which spread a bit later than the equal-winged cross (beginning from the mid-fifth century) had better prospects of development in Armenia. These crosses were depicted on hills, on stairs, placed on a ball, decorated with palmettes and lilies. The wings and the crossing of the cross were accented with jewels or buttons. The interpretation of these details allows us to come to the conclusion that the cross with pulled proportions incorporated both the victorious and savior philosophy, and was presented in the center of the universe as a tree of life on the paradise mountain, referencing the crucifixion and showing the future. - Crosses on a pole. Steles, as a rule, were concluding with a stone cross with three-dimensional or free wings, attached on pilasters, or on special cross-holders that were positioned on pilasters. Sometimes their bases, columns or pilasters bear cross carvings or more sophisticated cross compositions. The three-dimensional cross, due to a prolonged lower vertical wing, has a more extensive look, which aimed to present the Exalted cross of Golgotha. The composition of the free crosses included the palmette ornament, which started from the bottom of the cross and continued until the tips of the horizontal wings, with round holes or buttons on the wings and a pair of buttons on the ends of the wings. The holes or buttons originated from jewelry, where the small holes were intended to bear precious stones or to place holy relics under a glass, and the buttons were made from precious stones. The three-dimensional crosses that originate from northern Armenia are decorated with delicate carvings of Christ and saints, lily flowers, grain-like ornaments and rosette bouquets. The crosses on the pole can be divided into two types: movable and immovable. In the first case they have a large base, short stick, sometimes even a pilaster under the cross, and in some cases the cross-bearing circle is based on two sticks. Probably precisely such crosses on a pole were considered to be the crosses that were erected by Gregory the Illuminator and King Trdat. A large part of these crosses was made from wood, and some examples or some of their parts from iron. Together with three-dimensional crosses, the cross compositions carved on church structures, steles and memorials, were widespread. These compositions provide an opportunity to restore the process of philosophical and iconographical popularization of the cross in Armenia. Early Christian propaganda in Armenia placed great importance as much in the oral and written word, as in the image. The latter, in the first place, was intended to target uneducated peasants and aimed to play the same role for them as the book played for educated people. Another goal of the compositions was the presentation of God's history and order through different carving themes, images and symbols. But obvious issues were emerging with the presentation of the basic idea of Christianity - Christ's salvational crucifixion. It was difficult to present to the new believer a crucified but still powerful god. To popularize the idea of salvation through crucifixion, the Armenian Church chose to emphasize not the image (Christ) but the sign (cross). Despite on this the sign alone could not tell much about the idea. Detailed analysis shows that to make the prospect of salvational crucifixion understandable, Armenian priests used allegories which were familiar to agricultural societies: just as the grape becomes an "immortal" liquid after squeezing, Christ poured his blood on the cross for the sins of the humanity; just as the birds and animals enjoy themselves in the vineyards, the true believers will enjoy heaven that will come as a result of the crucifixion of Christ. Or, Christ's dogma itself is like a vineyard, and Christ is like a grape, and with learning that dogma opens the road to heaven. Thus, early cross compositions took on garden-grape iconography: the cross is pictured as a new tree of life, which either grows in a vineyard, or gives beginning to the vine, or bears Christ, his teaching and the vine symbolizing the followers. This heaven-garden-grape understanding of the cross became the basis of the khachkar composition. In comparison to the early medieval steles that consisted of a base, column, pilaster and three-dimensional cross, the first khachkars, as a rule, were plain, rectangular, intact stones. It is impossible to separate any one type among the early medieval steles that could serve as a prototype for the khachkar in its three-dimensional solution. The early medieval cross compositions having either an encircled equal-winged cross or the "pulled proportion" cross, respectively were becoming almost circular or rectangular. Due to the tree of life connotations of the cross, there was more potential for spreading the latter, "pulled proportions" form. The formation of the three-dimensional khachkar begins with selection of natural, unworked piece of rock, old stele, rounded or egg-shaped stone or construction block, on whose surface the stone composition can be easily placed. It ends with an arced or rectangular block. In the sense of composition, the first khachkars represent not just cross bearing, but cross composition bearing steles. Thus, the emergence of the khachkar can be described not simply as a carving of the sign of the cross on the western side of a free-standing stele, but the process of choosing the appropriate free-standing steles for the variety of types of cross-compositions. Thus, in the process of the formation of the khachkar's stele, the type of cross composition, rather than the type of stele, is playing a key role.